A hybrid heating apparatus heats potable water with waste heat from heat recovery units and insolation from solar collectors. A single circulation pump circulates fluid between at least one heat exchanger and each of the heat recovery units and preferably the solar collector. A single controller receives sensor readings from the heat recovery units and the solar collector units and receives a demand to heat the potable water. To satisfy the demand, the controller determines the extent to which the demand may be satisfied from heat available from the heat recovery units and the solar collector units and sends command signals both to the circulating pump to circulate the fluid and to appropriate ones of valves at connections to those heat recovery units and solar collector units to allow fluid to circulate to be heated to flow to the heat exchanger for effecting heat exchange to heat the potable water. 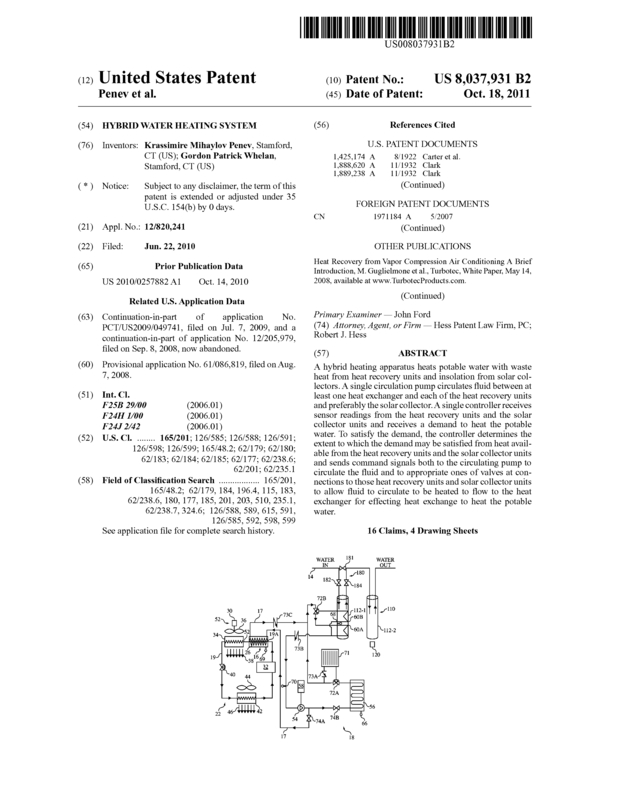 Page created at 2019-04-26 18:40:35, Patent Auction Time.